Is It Reasonable & Necessary ? Scuba Therapy is an inclusive approach to rehabilitation and enables clients to experience a weightless environment to do a physical workout. The workout is tailored to the client’s specific diagnosis. Scuba Therapy is an inclusive therapy that encourages all to benefit from a unique workout in a weightless environment. Scuba Diving has long been known to improve social interactions of divers due to the nature of the activity. Scuba diving boosts self-confidence and self-esteem and has even saved lives for those PTSD sufferers who turned to Scuba for their therapy. Necessary is something you have to have to improve your health and well-being due to the circumstances of your disability. Scuba Therapy is a new approach to rehabilitation and physical exercise for disabled and special needs that uses new therapy techniques combined with a weightless environment that is necessary if the client has goals to reduce pain or move more freely or strengthen their muscles that are not used day to day due to restrictions of their abilities. The benefits include increased self-esteem and self-belief that improves relationships and participation within a community/s. Scuba Therapy involves training that develops your skills and is an innovative community activity. Is Scuba Therapy related to your disability ? If you are disabled and able to pass our medical or be medically cleared by your or our dive doctor to use scuba gear to a maximum of 3/4m deep in a pool – then yes this is related to your disability. Does Scuba Therapy provide value for money ? Yes absolutely as it enables the client to work and build more muscles by being in a weightless environment. Scuba Therapy works because it uses a new approach to physical exercise designed specifically for the client’s individual needs. Will Scuba Therapy be effective and benefit you ? Yes only if you are prepared to put the work in and push yourself in all exercises we give you. This means you believe in yourself as much if not more than we believe in you. It will improve your movement of all limbs, boost your lymphatic system and reduce pain. For quadriplegics it’s safer than swimming because you have a regulator in your mouth so if your head goes underwater – it’s ok! Scuba Therapy also increases your lung capacity which is hugely beneficial for those in wheelchairs. Are we teaching you to Scuba Dive ? No. Scuba Therapy will not give you any certification to scuba dive, it is only for rehabilitation and therapy purposes. If you wish to pursue an Open Water Scuba Diving qualification after your Scuba Therapy is complete, then we’d be delighted to help you. We are very qualified to help amputees, disabled and many more abilities to explore the oceans, safely. What is the minimum age to attend a Scuba Therapy session ? As per our scuba diving standards and procedures and medical guidelines we keep to a minimum age limit of 10 years. What medical restrictions or clearances do I need to participate in a Scuba Therapy session ? As soon as you have requested to attend Scuba Therapy session, we will send you our medical form. You fill it in and return it to us, prior to your session. The medical is cleared by our Dive Doctor if he is satisfied you are medically fit to participate in a Scuba Therapy session, diving in a pool to a maximum of 4 meters deep. In compliance with SafeWork NSW, if you are not cleared by our dive doctor after he has seen you and /or your medical form, you cannot attend Scuba Therapy. How does Scuba Therapy help Veterans, PTSD and amputees ? John Hopkins University in the USA did a study on a small group of veterans with spinal chord injuries who underwent a four-day scuba diving certification. They reported significant improvement in muscle movement, massive reduction in Post-Traumatic Stress Disorder symptoms and increased sensitivity to light touch and pinprick on the legs. The advances were “dramatic” according to the researchers and suggest there may be a pathway for restoring neurological and psychological function in paraplegics that has been overlooked so far. Section 34 of the NDIS Act establishes the criteria for what supports are considered “reasonable and necessary” for the NDIS to cover. Yes. We will discuss your goals and aspirations you have outlined in your participant statement to illicit how we will help achieve and perhaps exceed your goals. Increasing muscle strength and improving mobility will aid in your social participation and enable you to apply for employment positions perhaps you aren’t currently looking into due to your current situation. The increase in self belief and self esteem we find all our clients leave the scuba therapy sessions with, will benefit you in more ways than just socially and economically. Because we have experienced transformations in reasonably short space of time, we see Scuba Therapy as great value for money to you the client and to your insurers as we quickly improve your quality of life whilst not a lifelong or long term therapy. You may want to attend Scuba Therapy twice a week and only need it for a short period of time not every week for the rest of your life. The benefits are wide in range and dependent on how committed you are to the therapy. Just putting scuba gear on and breathing underwater is hugely beneficial for some as it builds self-belief and self-esteem improving quality of life. For others, working out underwater is just the beginning as they can see and feel a difference in themselves in just one session. Scuba Therapy will improve your limbs movement, reduce pain and boost your lymphatic system. 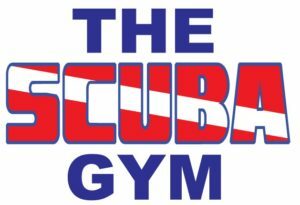 Building muscles, like in a gym requires hard work and commitment – the Scuba Gym is no different. Your independence will improve once we start your Scuba Therapy – because we work out underwater in a safe environment and doing specific exercises for your current diagnosis. Once your carer has assisted you in getting dressed for the water, we take over and care for you throughout the Scuba Therapy session. We will return you safely to your carer and/or wheel chair after each Scuba Therapy session so your carer does not have to get into the water with you. There are no strenuous demands put on your carer nor are they required to assist you in the water. If you are on an NDIS "Self Managed" plan, we will invoice you directly and you submit your invoices to be refunded by the NDIS. If you are "Plan Managed" with the NDIS, we will invoice you according to the NDIS price guide and you will work with the NDIS to be reimbursed. These are the categories best fit within the NDIS 2018/19 NSW Price Guide that you can use to be reimbursed. 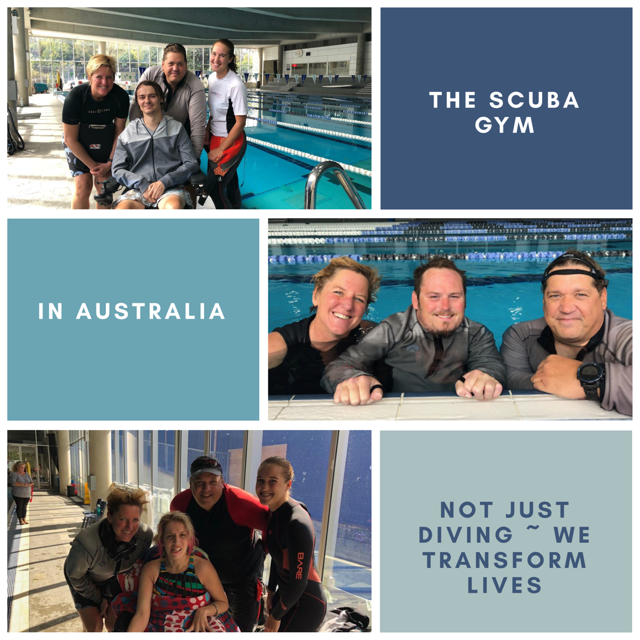 We are not yet an NDIS Registered Provider so if you are an All Managed plan we will work out a way for you too to benefit from Scuba Therapy without the help of the NDIS. We are happy to send you a Letter of Support so you can request funding from the NDIS for Scuba Therapy. The benefit to you. How will the service help you with the things that you want to do and achieve? Appropriateness of the provider. Is the service provider right for your circumstances and your injury? Cost-effectiveness. Is the service the most cost-effective option to meet your needs? Does it provide good value for money? Injury-related. How does the service relate to the injury sustained in your motor accident? The Scuba Therapy we provide has many “reasonable and necessary” benefits described above, that meet and exceed these criteria. What does it Cost to dive in ? Are you ready to benefit from Scuba Therapy ? The fee schedule will be discussed with you when you make contact with us.